The tropical lychee fruit belongs to the family of soapberry. It can be found widely in Asian countries, such as Philippines, Northern Vietnam, Southern Taiwan, Southern China, and Indonesia and in India but only during summers. The lychee fruit develops from evergreen tree, its leaves being pinnate. Externally, it is covered with a rough pink-red textured peel which can be easily removed. When you open it, it has a sweet layered flesh colored white, enclosing a seed which is colored brown. 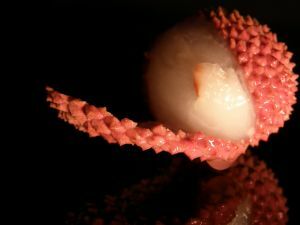 Lychee’s taste is to some extent like that of grapes, with juicy taste as well. Aside from it having tasty and sweet flavor, lychee is an antioxidant fruit with very useful health benefits as well as nutritional benefits. A superior source of fiber and carbohydrates, which are important for the human body. Lychee is regarded as digestive and also diuretic. This antioxidant fruit helps in the increase of body fluids, a health requirement for your body. Enhances in the increase of the body’s energy and the general feeling of being well and fit. Lychee fruit is very loaded with Vitamin C. In fact it has about 40% more Vitamin C as compared with Oranges. Its fatty acids are unsaturated, which is of great help in beta carotene’s absorption, and contains other vitamins which are fat soluble. You can buy Lychee products online. Buy fresh lychee online too! Have you had a lychee fruit? How did you like it?